I know that Rob had every intention of doing this one himself, but having given him plenty of opportunity, it became a matter of if you want something done, you do it yourself. So it was a drive from the Southern suburbs of Cairns, in the prevailing bleakness, up the Gillies range to the very attractive Yungaburra. During the drive, I thought the car was not handling with its usual zest, and on arrival at the pub, and observing a flat rear tyre, had a pretty fair idea as to the reason. But there was a beer to be had and the tyre would have to wait. 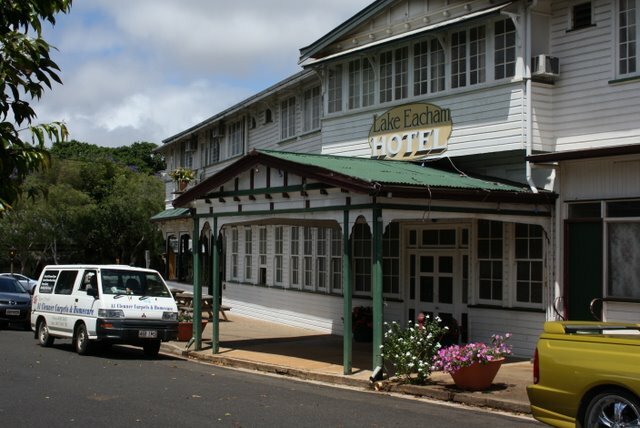 The Lake Eacham hotel went into recievership in May 2009 and ceased to trade. 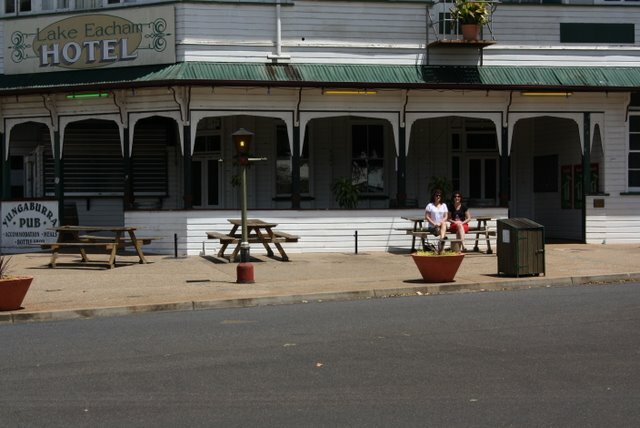 It was described in the media as a bitter blow to the disappointed locals and certainly, a pub as visually excellent as the Lake Eacham should always be available for trade. I certainly rember it’s halcyon days from the late ’90s with the formal dining events that were had on Saturday Nights, and were a great place for parties and celebrations. Apparently this practice was discontinued in the years leading to its demise. Perhaps many of the local drinkers discontinuing their clientèle had some bearing on its fate as well. However the good news is that a consortium of locals purchased the pub with the intention of returning it to its former glory. 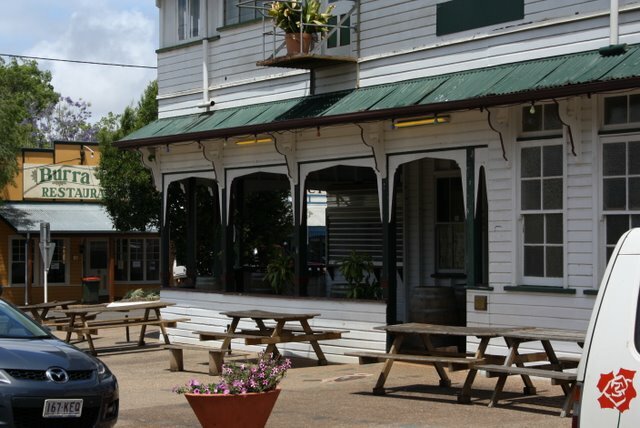 The pub was re-opened in time for the Yungaburra folk festival on October 23. Before this visit, I was last there on October 21. That will explain why the external shots in the image gallery were taken in fine sunny conditions – I was getting in early for this post! When we arrived we took the quickest path from the car to the pub with was through the reception area. Inside was an organised tour group, all nursing beers and having aspects of the pub explained to them – a very promising sign for business. From here we entered the dining room, and then went through to the bar. There were a few in the bar, and as it was only just afte 11.00 am, it was but early in the day. 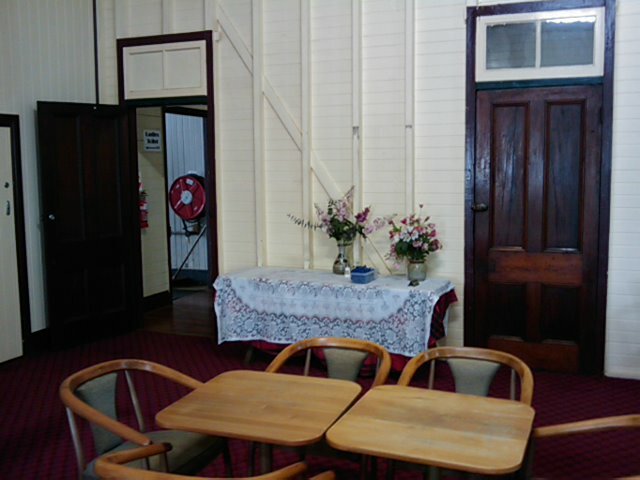 Most dispersed out the the veranda once they had been served. As our drinks were being poured, I asked the girl behind the bar about how business was since re-opening. She reported that trade was very brisk, with the place being booked out last night (accommodation) and that there had been two wedding receptions over the weekend. Seems that things are exceeding expectations which is great news indeed. The pub is clean and tidy, but it is obvious that there is plenty of work to do. Importantly, they are trading and earning money, so the improvements and renovations will come in good time. Apparently the kitchen was totally unusable when purchased and many items had to be replaced. Temporary partitions are used to conceal items that are awaiting disposal, or perhaps renovation. 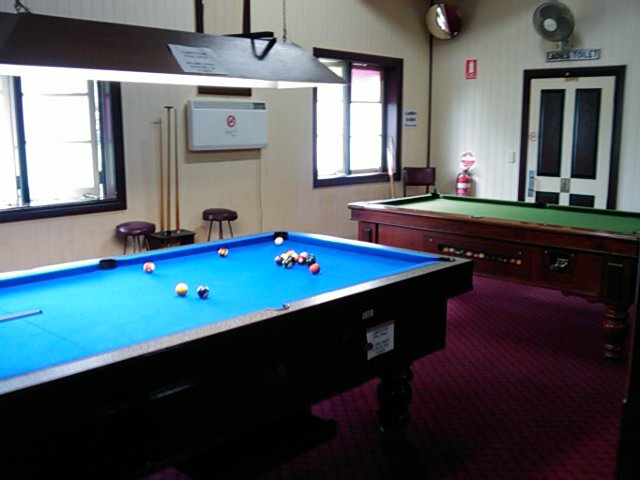 It is great to see that one bunch of hidden stuff are the old pokies, which will not feature under the new management. Anyway enjoyed a couple of pots of gold and a game of pool and then it was time to change that tyre. But the drizzle had turned into rain of some significance and in hindsight, the job should have been done on arrival when it wasn’t raining so hard. And I would have earned those beers by then. Got bloody soaked. 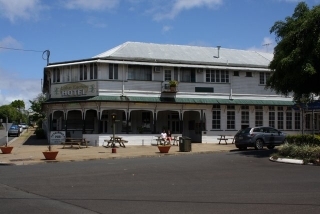 On the trip back we stopped at another iconic location, the Lake Barrine Tea house, and surprisingly enough the devonshire tea when down pretty well, despite the earlier beers. 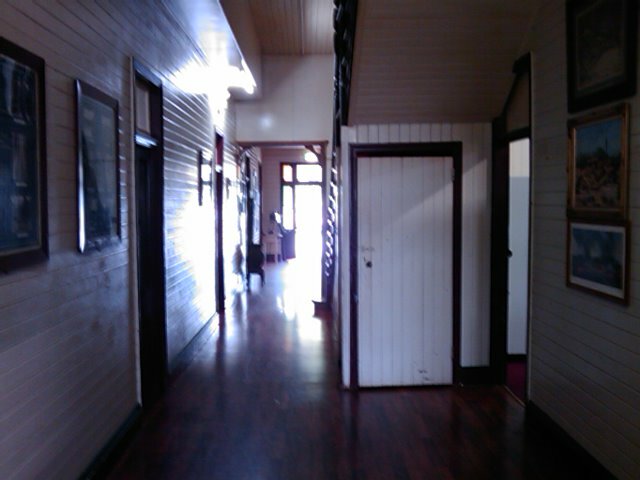 The internal shots in the gallery below were taken with the dodgy phone camera. 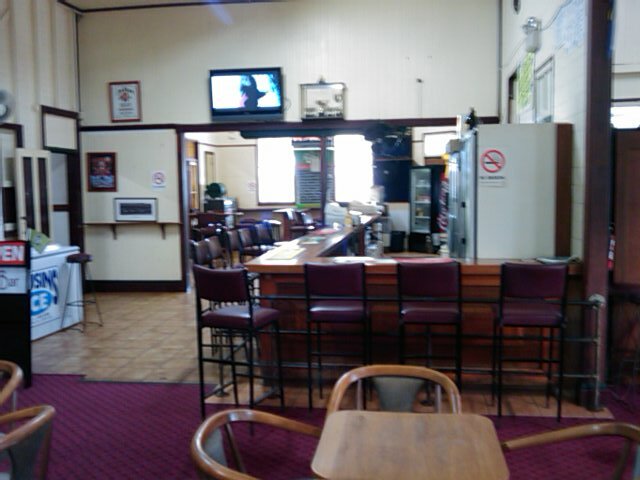 When there were actual people in the bar, the images taken were too blurred to use. So the only usable one is of an empty bar. If you would like to see our actual track from the South of Cairns, up the Gillies and into Yungaburra, you can download this file and open it up in Google Earth. The track is coloured according to the elevation. This link will take you straight to a google maps overlay – but for a short time only. These are only stored temporarily. 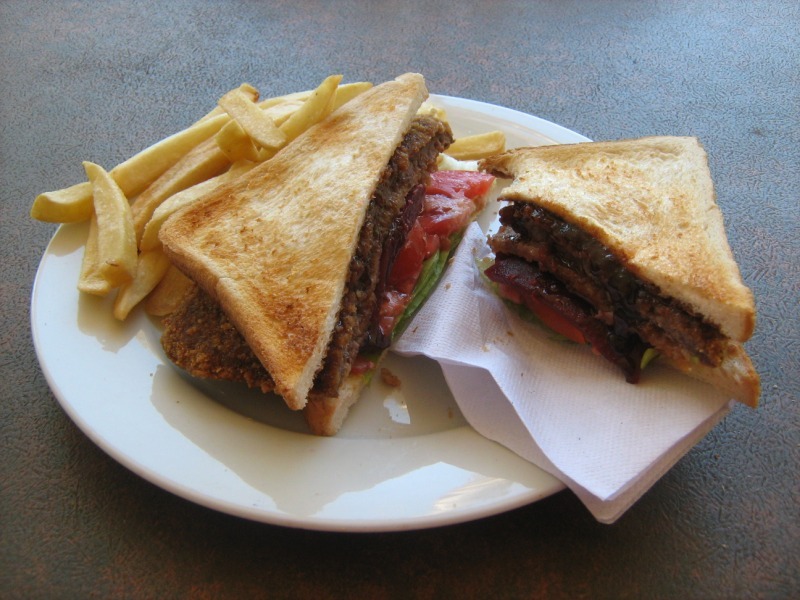 This entry was posted on 8 November, 2009, 4:44 pm and is filed under Pubs, Queensland. You can follow any responses to this entry through RSS 2.0. You can skip to the end and leave a response. Pinging is currently not allowed. Great to hear that the Lake Eacham is back up and running with a decent future ahead of it. I’m looking forward to my next beer there! As a local we attend there often, including the Folk Festival. 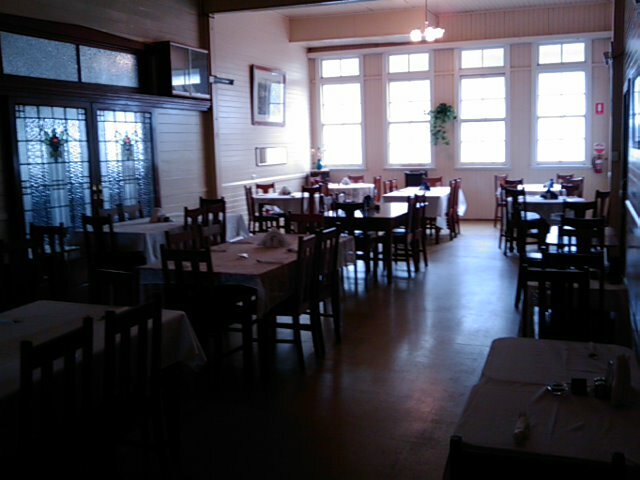 The ambience is great, the food service excellent. However, the bar service is lacking. Employing backpackers who have no idea what a TED is sets the bar low. However when the bar manager greats local residents and serves them in the line behind you, when you have been patiently waiting for some time has really turned us off. We were regulars, but the experience was very negative. How about you look at your customer service guys. You may not have known us by name, but we are locals and will provide a testimonial to other residents and visitors. Very disappointed! !